When parents entrust their children to your daycare center, you want to make sure that the care you give far surpasses expectations. What do you want in a daycare center? To begin with, you want the right daycare furniture, so you can ensure that little ones are properly fed, changed and rested throughout the day. 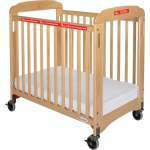 Safe and durable daycare cribs and play yards will help babies and toddlers nap peacefully. 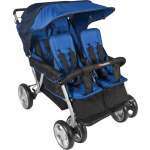 Our daycare strollers make it easy to take the class out for a walk. When a baby needs to be lulled to sleep or fed, try one of our cozy glider chairs. Do I really need a glider chair in my daycare? Soothing a distraught child is much easier with a gently swaying swivel glider chair or rocking chair. The back and forth or side to side repetitive motion helps babies relax and calm down so they can drift off to sleep or eat peacefully. Rather than having to carry growing children around all day, caregivers can rest their backs and arms as they relax and snuggle with little ones. Even older toddlers can benefit from the calming motion of a glider chair when they are feeling upset or out of sorts. 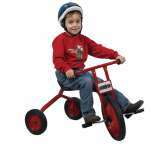 Once children come to enjoy the relaxing effects of repetitive motion, they may even want to relax independently. Our baby rockers and wooden child-size rocking chairs will fit well in a reading corner or learning center. They are designed to look just like adult rocking chairs, but are the perfect size for your little ones. With a child rocker, children can take initiative by choosing to sit down and enjoy some calm alone time with a favorite book. What features should I look for in a daycare crib? Babies and toddlers need to feel safe and comfortable in order to fall asleep. With a tough daycare crib from Foundations, you won't have to worry about safety or convenience. All of the cribs we carry are attractive and user-friendly, with locking casters that make it easy to transport them when the room needs to be rearranged. 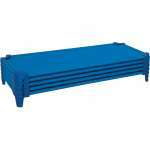 We have compact models and folding models for those who need space-saving solutions. 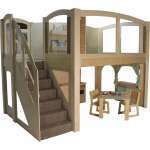 Choose any of our wooden or steel models so little ones and caregivers can rest assured. If you don't need a full crib, or you would prefer a number of options, you can try one of our folding play yards. Play yards take up less space than cribs and can be set up and fit virtually anywhere. They are appropriate for infants and toddlers. 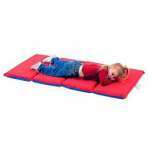 This compact solution enables you to create an appropriate napping space virtually anywhere. A comfortable crib requires some soft and snuggly linens. In addition to making sure that mattresses provide great padding, you also need sheets that are made for the soft and gentle skin of babies. We have super soft blankets, fitted sheets and zippered sheets that are designed just for cribs. Zippered sheets are the safe choice because they won't shift around or come off while little ones are resting. What is the best daycare stroller? After a relaxing nap, your young learners should be ready to go out and explore their surroundings. No one likes to stay inside all day, so when the weather is nice, consider going on a class outing with one of our sturdy daycare strollers. Six-seater and four-seater models enable one caregiver to push multiple children at once for a safe and smooth ride. Our selection of models from Angeles and Foundations includes durable, easy-to-steer baby buggies with individual harnesses for each child. Do I really need a changing table for childcare? When you are taking care of multiple babies and toddlers at the same time, having a changing station is essential. Changing tables keep all necessary supplies such as diapers and wipes organized, and enable caregivers to supply children with clean diapers without straining their own backs. We have models with built-in storage and steps for older children as well as separate storage shelves and cabinets that can be mounted right above the changing table. Choose from wall-mounted and freestanding models to find the ideal arrangement for your classroom. School isn't all about outings, sleeping and changing, little ones also need a place to eat and do classroom activities. While most babies eat in high chairs, an arrangement with individual seats can take up a lot of space and be quite limiting to social interaction. Our six-seater toddler table gives little ones the support they need to sit up securely, so they can sit next to each other and easily reach the table surface. This arrangement is ideal for snack time, projects and group activities. A supportive environment with the proper daycare furniture will help babies and toddlers thrive. Whether they are in the classroom taking a nap or out and about on a class adventure, little ones are sure to benefit from the safe and user-friendly designs of our models. If you are having trouble determining the ideal style or quantity among all of the excellent viable options, contact the Hertz Design Center for free project-planning advice.